Archer on Airguns: Hammers Scope Rings Are Great Value. But Do They Beat Leapers? Hammers Scope Rings Are Great Value. But Do They Beat Leapers? New to Archer Airguns are Hammers airgun scope rings. These great value rings fit scopes with 1-inch tubes and they clamp firmly onto standard airgun dovetails. Both Hammers Medium rings and Hammers High mount rings are available. When I first saw these rings, I thought "Hey, these are just like Leapers rings but they cost 30% less!" Well I was wrong. Yes there are superficial similarities between the Hammers and Leapers rings, but there's more differences, as I'll explain here. The Hammers rings have 4 ring clamping screws and 2 dovetail clamping screws, just like the Leapers rings. This is far better than the rings supplied as standard with many "$100 and 1000fps" spring piston air rifles that are widely available, such as the Ruger Air Hawk, Crosman Optimus and Beeman RS2. More and larger clamping screws are among the hallmarks of strong scope rings. The increased number of screws compared to the scope rings on those air rifles makes for more stable scope mounting and improved accuracy potential. 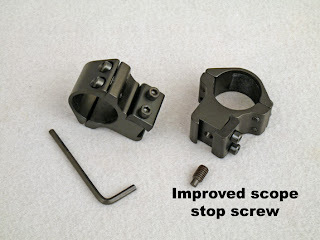 Both Leapers and Hammers rings feature a scope stop screw in one of the rings that is used to counteract the strong recoil of high powered spring/piston air rifles. 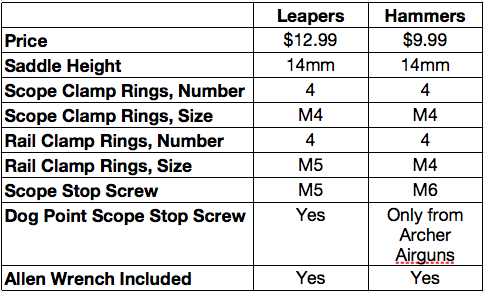 Leapers and Hammers scope rings comparison review. Hammers uses the same size machine screws - M4 - as Leapers to secure the rings around the scope. Honors even! Leapers uses an M5 setscrew for the scope stop. Hammers uses a huge M6 setscrew here. But there's a problem. 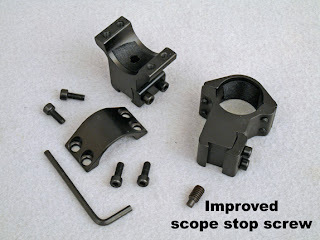 Hammers supplies a pointed setscrew that will eat into the metal of the scope stop hole or slot under recoil of powerful spring/piston air rifles. The result is inaccuracy due to a wandering point of impact as the scope moves back on the gun. To overcome that problem, Archer Airguns is supplying a really solid M6 dog pointed setscrew with each pair of Hammers airgun rings. That fixes the problem for good. So which company wins the scope stop comparison? Hammers - but only if you buy them from Archer Airguns and have the extra scope stop screw. If you buy them elsewhere, it's Leapers. Above, Hammers High Mount Airgun Rings. 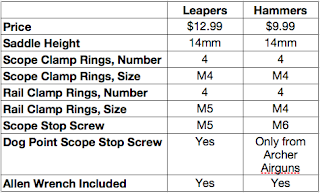 For confirmation, we're comparing the Hammers rings against the Leapers Accushot Medium Airgun Rings, Model RGPM-25M4 and Leapers Accushot High Profile Airgun Rings, Model RGPM-25H4. I feel that the Hammers rings offer good quality at an excellent, low, price. Are they better than Leapers great products? If you buy them from Archer Airguns, the price gives Hammers an advantage. The 13/22 SuperSear is Back!